On July 26th, I got to tour Tompkins Square Bagels. If you have never been or had a meal catered from them yet I highly recommend it. Whether it is a slower week day or busy weekend morning Tompkins Square bagels makes anywhere from 900-2,000 bagels daily. They are rolled perfectly, boiled for around 90 seconds and then baked to perfection. This 3 step process gives you an amazing bagel with a toasted outside and soft dough inside. Getting to watch this magic happen with my own two eyes was a great experience. During my tasting I started out with an everything bagel with bacon, egg, cheese, and scallion cream cheese (per Frank’s, the General Managers, recommendation). The scallion cream cheese is a great twist to the classic BEC. If I was not full enough already I then got the french toast bagel with birthday cake cream cheese…yum is all I have to say. 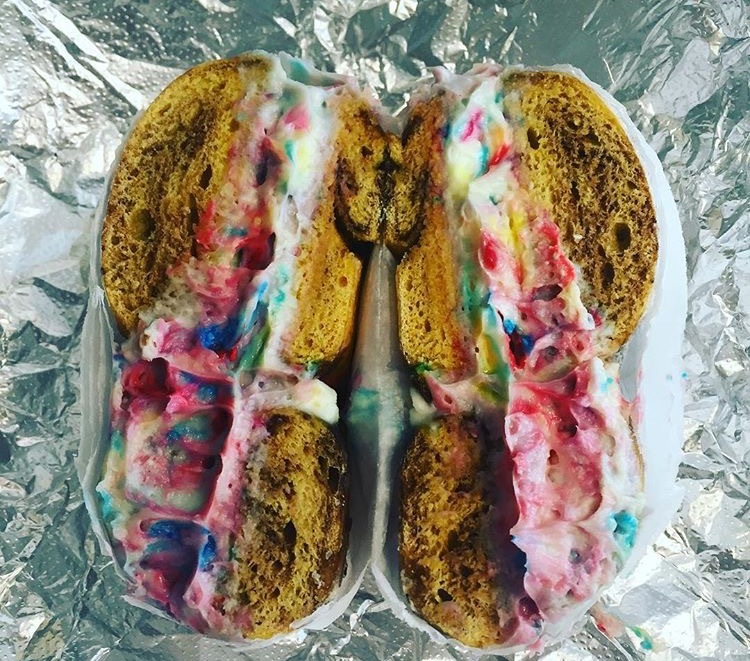 If you enjoy any type of sweets this bagel is for you. We were lucky enough to have Christopher Pugliese, the Owner, give us a little more insight on the background of TSB. What is your secret to keep customers coming in? Hospitality. Our motto at TSB is ‘We are in the happiness business.’ We do whatever it takes to make people smile. That is the goal of every person on staff no matter what their job is that day. What is the most enjoyable part about restaurant? Restaurants are extremely hard work. When anyone asks me what it’s like I tell them it’s like taking all 128 of your undergraduate credits in one semester for the rest of your life. You can literally go to bed thinking it’s all under control and then wake up in the middle of the night in sweats because you just remembered that big project that’s due …. TOMORROW! That’s everyday. There is always something to do. Every now and again, I will stand outside the front of my shop on a busy Saturday or Sunday and just take it all in for a few minutes; The line of laughing guests, the baristas serving coffee, the grill men flipping eggs and bacon, the baker pulling hot bagels out of the oven and dumping them into the baskets. I’ll see little kids with their parents and think ‘These kids will remember this store when they’re older the same way I remember the store I grew up with.’ To watch it all is like looking at a piece of living art. So, that is my enjoyment. THEN IT’S BACK TO WORK! What is the background story behind the opening of the restaurant? I had worked in my neighborhood bagel shop from about 16 through college. Then I went and worked in NYC restaurants mostly serving but occasionally managing or helping BOH. I had the time of my life. However, towards the end, I felt the industry had changed in a way I wasn’t comfortable with. The rise of the Food Network/Foodie Culture/Rating Sites had brought a pretension to the industry that really made it less enjoyable for me. It became more about people feeling entitled to some ‘life changing’ experience everywhere they went than the simple act of gathering together and enjoying some great food and interacting with others. I kind of got to a point where I said ‘Ok Chris, what’s the least pretentious kind of place you can open? Ah, bagel shop!’ I also think I was trying to recreate the homey bagel shop of my youth. That was the neighborhood meeting place where everyone got together and enjoyed on weekend mornings. What is your favorite dish on the menu and why? Just the classic stuff. Sesame bagel piping hot out of the oven with butter. Reminds me of being 16 and hitting up the bagel spot at 6AM after a night sleeping on Brighton Beach with my buddies. On the other side, Birthday Cake Cream Cheese on a French Toast Bagel is just a happy thing. It makes people light up and smile and, I like making people smile. That’s why I’m in this business. What sets you apart from all the other restaurants in your cuisine? Well, we make a classic, old style, NYC bagel. 5 basic ingredients based off a recipe that goes back to the 1950’s. We also hand make every cream cheese and salad in the shop. Everything is made fresh daily in small batches. If we run out, we run out. We’d rather run out one day than serve something day old the next day. Food aside, I think we have a very different mentality, as far as service and customer experience goes, than most bagel shops. I spent many years as a server in NYC. I understand how a guest thinks and I’m a people pleaser by nature. I’m always putting myself in the guest’s place. It was very important to me to build the kind of place that everyone, meaning people from all walks of life, could come together in and feel comfortable visiting. The ‘Cheers’ philosophy. That place where everybody knows your name. I also put a lot of emphasis on the hospitality aspect of the business when training my staff. This was challenging at first since most deli/traditional bagel workers are more chef/food prep oriented and don’t really focus on hospitality. It took a lot of training and explaining for me to get through how important the other side of the business is. I say things like ‘Look, imagine what a kick the guest would get if you (speaking to a grill man) saw he was waiting to order and popped out from your station to help him! Like how cool would that be!’ Once they got on board, they dug it. Contact catering@foodtoeat.com to setup your next catered meal with Tompkins Square Bagels.